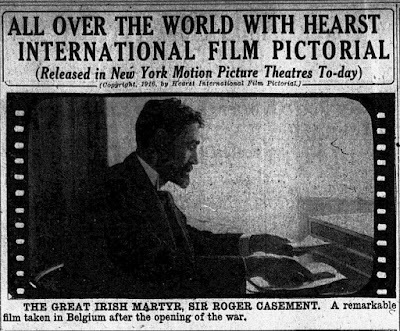 Sir Roger Casement featured before in an earlier weblog in which we described how the only known extant footage of this controversial Irish freedom fighter was filmed. 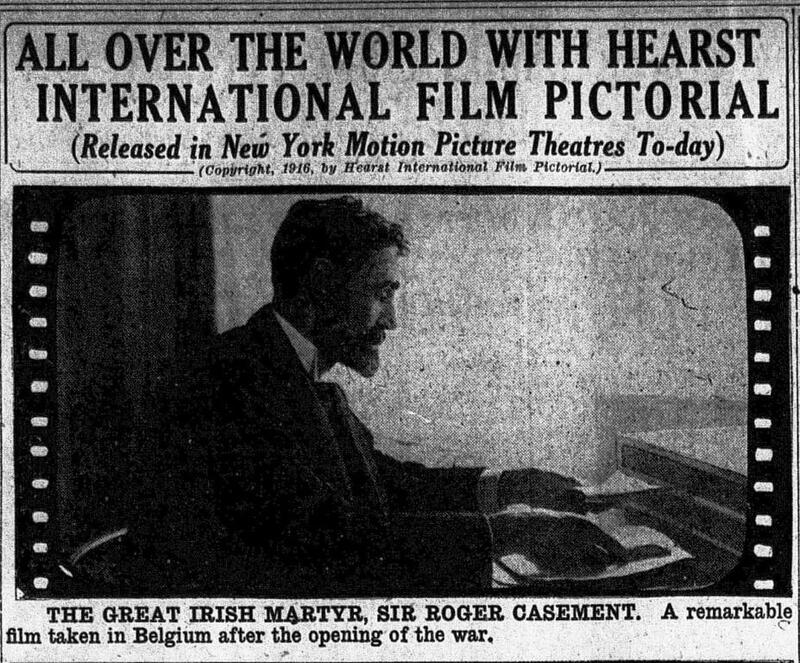 Casement appeared before the movie camera in April 1915 when he was trying to enlist the Germans’ support in a general rising against England and the raising of an Irish Brigade. We recently found an extended scene from this unique historic footage in a contemporary newsreel. Casement was filmed by Albert K. Dawson, an American cinematographer who was in Berlin at the time. With the assistance of American correspondent Franz Hugo Krebs, Casement was persuaded to pose for a film and photo shoot in the hotel where he was staying. The full story can be read in an article by authors Cooper C. Graham and Ron van Dopperen for the Historical Journal of Film, Radio and Television, that appeared in 2016. The newsreel compilation from the Periscope Film collection can be viewed here. We have uploaded Dawson's film from this collection on our YouTube channel. On March 13, media historian David Mould lectured on World War I cameraman Donald C. Thompson. His presentation Images of World War I - The Films of Pioneer Kansas Photographer Donald C. Thompson was part of a series of presentations by Kansas University on the centennial of the First World War. David H. Mould, Ph.D., is Professor Emeritus of Media Arts and Studies at Ohio University. Thompson has been one of his favorite research subjects ever since Mould did his master thesis on the news films of World War I in the 1980s. 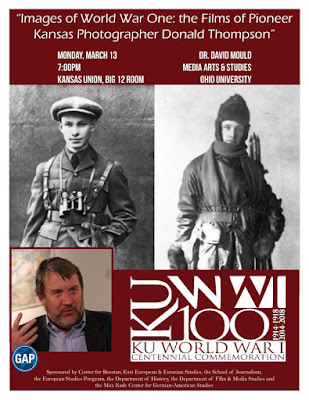 In this lecture at Kansas University David Mould tells about Thompson's approach to news coverage, how he projected his self-promoted image of the "photographer/adventurer", gained access to the frontlines and staged some of his war scenes. To give the audience a proper sense what it was like to watch a war film in those days David shows a selection of scenes from Thompson's movies, accompanied with contemporary music. These scenes are very interesting. To start with David Mould presents clips from Thompson's film With the Russians at The Front which was shot on an assignment for the Chicago Tribune in 1915. Mould has some fascinating inside information on the making of this movie, based on letters by Robert R. McCormick, the Chicago Tribune co-editor who accompanied Thompson during this trip. Next he shows parts of Thompson's film Somewhere in France (1915) and a good copy of Thompson's subsequent movie which was produced with the French army in 1916: War As It Really Is. David Mould recently edited Thompson's letters to his wife which were written during his stay in Russia while he was covering the Russian Revolution and the war against Germany on the Eastern Front. Shortly before his presentation at Kansas University David contacted us on our discovery of footage from Thompson's film The German Curse in Russia (USA, 1918). We had made a reconstruction of this remarkable film by Thompson, based on films in the Axelbank Collection, which was also in David's presentation. A recent interview with David Mould on this subject was also published in this newsletter of the Center for Russian, East European and Eurasian Studies (Fall 2017). We have uploaded David Mould's presentation on Thompson on our YouTube channel. Thank you, David, for sharing your latest research with us! On September 26, 1918, the American Expeditionary Force (A.E.F) was sent into the abyss that was called the Meuse-Argonne Offensive. The battle cost 26, 277 lives, making it the largest and bloodiest operation of World War I for the Americans. Among the casualties were many soldiers of the 35th Division, a unit that virtually collapsed under the strain of modern warfare. Footage showing the aftermath of this terrible battle was found recently by the authors in the archives of the Imperial War Museum. 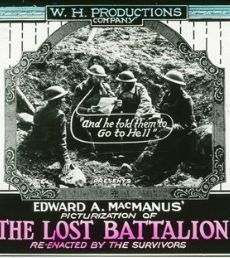 The Meuse-Argonne Offensive provided film history with a suitable backdrop for The Lost Battalion (USA, 1919), a movie based on the actual experiences of soldiers from the 77th Division who had found themselves completely cut off and surrounded by German forces. While all of this was happening nearby their comrades of the 35th Division were at risk of being completely annihilated. After only 5 days of fighting the 35th Division rapidly became combat ineffective. One reason for the 35th Division's poor performance was inadequate training. But the division's greatest failure lay in grave lapses in its leadership as a result of mistrust between the unit's Regular Army and National Guard officers. Author Robert H. Ferrell in his book Collapse at the Meuse-Argonne (2004) places the blame squarely on divisional commander Major General Peter E. Traub who sowed confusion within the unit by relieving all infantry brigade and regimental commanders and replacing them with Regular Army officers only days before combat started. As a result, when the attack was launched the chain of command ceased to function and the 35th Division suffered over 7,000 casualties. Shortly after the division was pulled out of the line on October 1, 1918, the soldiers were transported to a quiet sector near Verdun where they could rest and recuperate. 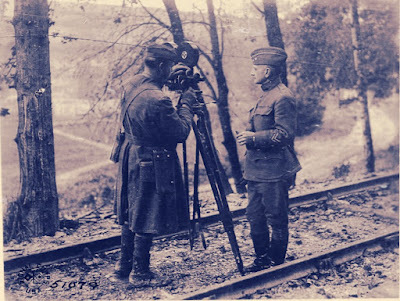 On October 18, cameramen Edwin F. Weigle and Thomas J. Calligan filmed General Traub on an inspection tour of his men. We could identify the cameramen because of a still photograph which has their names and shows how General Traub posed before their movie camera. As mentioned in a previous post, Weigle was the photographic officer of the 35th Division and an experienced war photographer who had previously covered the Great War for the Chicago Tribune. Weigle and Calligan on that same day also filmed men of 'C' Battery, 130th Field Artillery of the 35th Division, carrying ammunition in a wood near Sommedieue, as well as the sole surviving officers of the 1st Battalion, 138th Infantry Regiment. As an interesting side line, Battery D of the 129th Field Artillery Regiment of the 35th Division at this time was commanded by Captain Harry S. Truman, the future President of the U.S.A. The smiling faces of General Traub and these surving officers, as recorded by Weigle and Calligan, do not reveal the true tragedy that had taken place only three weeks before. But the scenes remain an important source on the history of the 35th Division and the American Expeditionary Force during World War I. For more information on the cameramen of the 35th A.E.F. Division in France check out this previous weblog.